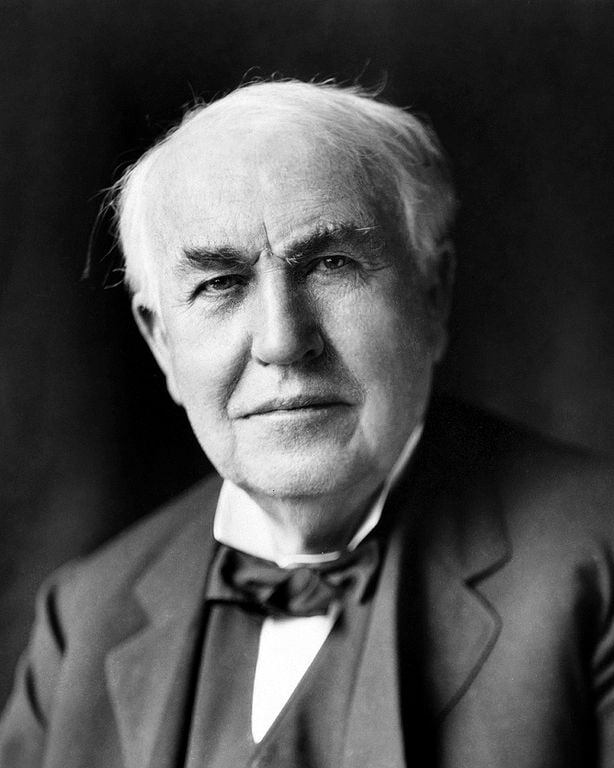 This vintage film – originally titled as “The Story of Thomas A. Edison” – is a biography documentary about America’s greatest inventor, Thomas Edison. It was produced and directed by Academy Award-winning documentary filmmaker Robert Snyder (1916 – 2004), and distributed by the U.S. Information Service (USIS). Although the exact date is unknown, we can confidently say that the film was produced between 1953 and 1984. Edison was voiced by American actor Sam Raskyn (1911–1984). Edison appears in the film from 25:14. We can see him talking to people, working in his laboratory, listening music and hiking with his good friends: Henry Ford, the founder of the Ford Motor Company, Harvey S. Firestone, the founder of the Firestone Tire and Rubber Company, and John Burroughs, the naturalist. His is one of the great American saga. Some say the greatest. It started humbly on the night of February 11, 1847 in a small red brick house in Milan, Ohio the home of the man who ran the town shingle factory on that February night. He sat in the partner of his home in the bedroom. His wife lay awaiting the birth of her seventh child that had claimed earlier children so that the father's prayers fill the anxious hours until the father inscribed the name of a healthy husky boy in the family Bible humble beginnings but not poor. The Edison children were reared on good food and look good book. They were all good hard commonsense kids said the neighbors except for young Tom. They called him the curious boy meaning he had too much curiosity about things when he was five. They found him sitting on some duck eggs to see if they could hatch them. It was possibly his first experiment. It was not successful when the family moved to Port Huron Michigan. The curious boys started school. Exasperated his teacher. The boy is backward. The teacher complained. All he does is ask questions. Nonsense said the boy's mother. I'll teach you myself. And she did her method was reading writing and arithmetic. And then she simply encouraged him to read read read the more he read the more his curiosity grew. By the time he was twelve he wanted to know what the whole wide world was about. So he decided to go into business 1859. The great railroads were beginning to criss cross America and a twelve year old boy would naturally go down to the railroad station to seek his fortune. Tom Edison talked the Grand Trunk Railway into giving him the job of selling candy and newspapers on the daily run from Port Huron to Detroit. He also talked the conductor into giving him a corner of the baggage car. In this corner he set up a chemical laboratory. His curiosity didn't stop a chemistry. He got interested in printing when he was fourteen. So he set up his own printing press and started the first news paper ever published on a railroad train and a time where the weekly Herald published by a for Al as he was called Edison was only a single sheet affair but a crime. It was general information and gossip. Local and international news business back and bigger vital statistics philosophy reason. Just back with a never had weight enough on the face of the earth to govern the councils of man. But at the height of his success as cameras candidate butcher publisher a philosopher. Two accidents occurred. First he became partially dead. You'll be reading my refuge was the dry library. I didn't read your book. I read the librarian I learned how to operate a telegraph ticker.